Deputy Speaker, Acharya Yeshi Phuntsok with other guests. Dharamsala: On receiving invitation from district administration of Dharamsala, Deputy Speaker of Tibetan Parliament-in-Exile, Acharya Yeshi Phuntsok and Kalon Karma Yeshi attended the celebration of 70th Republic day of India on 26 January 2019, held at Police ground, Lower Dharamsala. 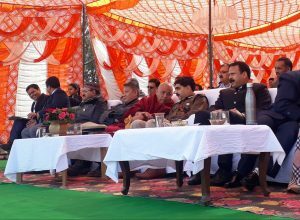 The ceremony started with offering of floral tribute to the martyrs at War Memorial, Kacheri and the remaining function was organized at Police ground, Lower Dharamsala. The chief guest at the function was Shri Govind Singh Thakur, Forest Minister of Himachal Pradesh. 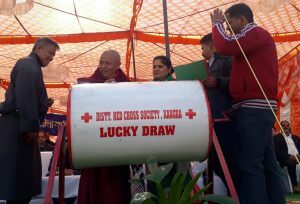 The chief Guest, Kalon of CTA, Deputy Speaker of Tibetan Parliament-in-Exile and other guests drew winners from the lottery raffle box, organized by the Red Cross Society, Kangra, a voluntary humanitarian organization to protect human life and health based in India. Deputy Speaker presented a ceremonial scarf and a Hindi translated book, Freedom in Exile by His Holiness the Dalai Lama to the Chief Guest. The celebration concluded on a festive note with vibrant cultural performances by the local Indian schools and the Tibetan Institute of Performing Arts.